Lieutenant Colonel Robert E. Solliday, USMC (Retired), husband of Kathryn Charlene Solliday for 62 years, died February 22, 2018. He was born December 4, 1931 in Philadelphia, PA to Grace and Harry Solliday. 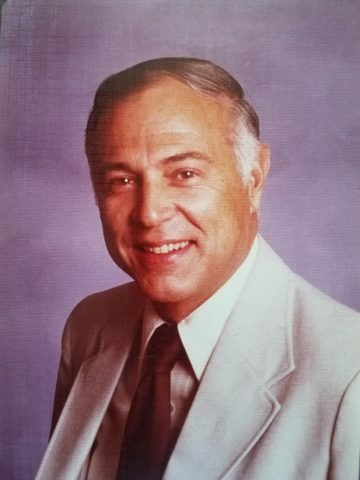 He is survived by his children, Robin Heyne and husband, Bill of Nashville, TN; Cynthia Starke and husband, Don, of Denver, CO; and Robert E. Solliday, Jr., of Santa Monica, CA; grandchildren, Billy and Christian Heyne, and Danny and Elizabeth Starke; brother, Gordon Solliday and wife Sandy, and their children Heather Kotiranta and Tony Solliday, of San Clemente, CA. Robert attended Lafayette College in Easton, PA on a football scholarship, was a member of the Phi Kappa Psi fraternity, founded the Lafayette Flying Club, and served in the Army ROTC program. He earned advanced degrees from Univ. of Maryland, Naval Post Graduate School and Univ. of Southern California. Upon completion of Flight Training and aircraft carrier qualifications, he was commissioned as a Marine Corps officer and earned his Naval aviator wings from Pensacola Naval Air Station in 1953. He was a veteran of the Korean and Viet Nam Wars. His career included Marine Corps Night Fighters, Attack Squadron Pilot, Marines Close Air Support Demonstration Team Pilot, Naval Test Pilot School Class 20, Flight Test Division / Naval Air Test Center, Naval Postgraduate School Instructor, NASA astronaut candidate for Mercury and Gemini programs, A-7A Missile Programs Manager and Time Magazine A-7 Man of the Year, Commander of Marine Corps Fighter/Attack Squadron 232 (Red Devils). He retired from the Marine Corps in 1972 to become Hughes Aircraft Chief Test Pilot for the F-14/A Phoenix missile program and the A-4M ARBS aircraft program. As a lifetime member of the Society of Experimental Test Pilots, he served as Vice President, Treasurer, and Membership Committee chairman. Upon retiring from the aerospace industry, he and his wife Charlene moved to Florida where he taught at the Florida Institute of Technology. They loved traveling abroad, visiting family and friends, and cruising their boat in the Out Islands of the Bahamas. Robert had a distinguished career as a United States Marine who served his God and Country with honor. He was a loving and devoted husband, father, brother, grandfather, and an inspiration to many. A celebration of life will be held on Friday, March 9, 2018 at Woodmont Christian Church, 3601 Hillsboro Rd., Nashville, TN 37215 with visitation at 1:30 PM followed by a service at 3:00 PM. Internment will take place at Arlington National Cemetery later this year.